Here you will find the answers to important questions like: how do I obtain all the power cells in the Lost Precursor City area and all the other places? Click on the link and you will be taken to the power cell walkthrough for the location. Here in the lost precursor city everyting is a bit different. At least in this solution for the power cells. In this case I will describe all the locations how they appear and additional how many orbs there are in this room. jump on the blue switch to make the dive chamber dive down. Here you can find the scout fly 1 and to go on you have to find a way to the top. Here are 4 Scout Flys hidden. You can get 2 of them at the 3 colored chambers by releasing the corresponding chamber and then watch out where the scout fly gets beamed to. Then use a rotator to get there. There is also a power cell in once of the chambers, use the contraption to make it appear somewhere, make your way through the obstacle course and grab it. The obstacle course is doable, you won't make it the first time, but have faith and trust in your skills and memorise how the different obstacles behave and get a feeling for it and you will do it. As the name implies a lot of pathes cross here or they part. At first take the right path. At first you have to fight your way over the moving bridge with the hot tube in the middle. After this you will reach the only riddle in the game. Your task is to light up all plattforms by jumping on them and in the end standing in front of the door. But at first kill the lurker around here because otherwise this thing is just annoying. And now you have to have a plan of what you are doing, but before doing anything here is a small hint, which is, use the double jump and afterwards the sliding flight to reach the platforms over a wide gap or take another path. The best thing to do is starting in the front row middle and via 2 platforms reach the platform at the front left edge. From here jump 2 plattforms to the back left. Now cross the whole field diagonally via 4 platforms to the front right edge. Now use 2 platforms to reach the one in the back right and from here you reach the middle platform in the back with 2 jumps and you are right in front of the door you want to be. This time take the path to the left. Here you only pass through. Start the mechanism and some bridges appear. Always use a double jump and you will eventually reach another power cell. It is doable, maybe it easier when you activate the plattforms by jumping onto the button at the end farest away from the pool and rolljump from there to the first platform. From there on just doublejump your way up. Here you kill all the lurkers inside at first with a divejump while they are standing still, so that they are not annoying as hell as they are when they are there. Release the chamber by jumping on the mechanism inside the chamber. The chamber rises after this and a power cell appears above the chamber. It IS possible to reach the power cell from the outside from the island. Use a doublejump with slideflight for this, but is is way more easy to just drown the chamber again by using the mechanism again and then just collect the power cell from the roof of the chamber. You have to dive down again anyways. 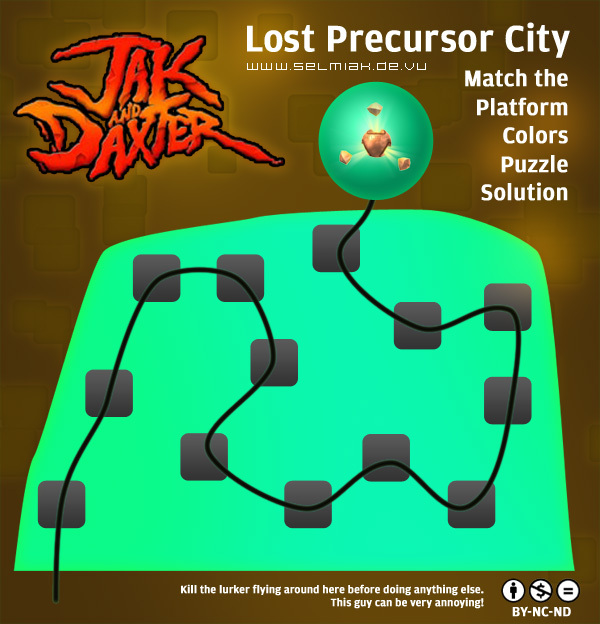 Well, if you want to complete the Lost Precursor City, that is. The hallway is just too freaking long, but it is possible to find a way through it without losing a single piece of health. One way is to use the rolling jump while the engery field is still on and then just hurry up and run on. Or you use a doublejump while the energy field is still on and land in the water (it is best to land while the energy field is off) and use another double jump to get out of the water and then use another slideflight additional to that. high above the ground the Scout Fly nummero 7 can be found here. You need a lot of skill for this slide and also practise a lot to master it. But fear not, everything is always the same everytime you slide down there. You will get used to it if you try long enough. After you got this power cell the level of the dark eco down here at the bottom of the lost precursor city starts to rise. Now you have to be really fast, load up on masses of this blue eco and run for all you got. Don't miss the lurkers around here and run into them, blue eco doesn't make you invincible, so you better kill them. Once the way up doesn't go on you have to jump into the middle and then jump up. Once you got this power cell too you will enter the stairs room. If you think you've got what it takes just slide down slide 1 and enter the chamber. This will bring you back to the surface without a hassle.